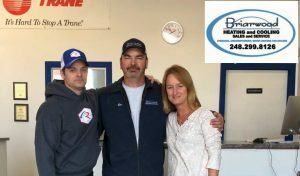 I want to tell you about two amazing people Lee Deel and Renee Deel, owners of Briarwood Heating & Cooling. Thomas Richards Charity was working with a family that needed help. They were living in their trailer using an electric heater to keep them and their 3 month old baby warm, since their furnace was broken. Lee installed a new furnace without batting an eye, while we worked with the state to help out. Unfortunately, the state wasn’t able to provide the funding. Again, Renee and Lee didn’t bat and eye, they covered the whole cost of the furnace and installation ($2500.00). That is what good people do when they see people in need. We are so lucky to have these two as a part of the Thomas Richards Charity community! This is not the first time they have helped people in need as they have been a sponsor of the Matt Moscato Charity Golf for years. This was our chance to help out Brandon Matja, a Sophomore at Henry Ford II Strike out Leukemia. Lots joined the fun Cosmic bowling at Imperial Lanes in Clinton Township on the evening of December 22, 2017. The night consisted of raffle baskets given to drawn winners, delicious food consumed, and glow sticks lighting up the alley. 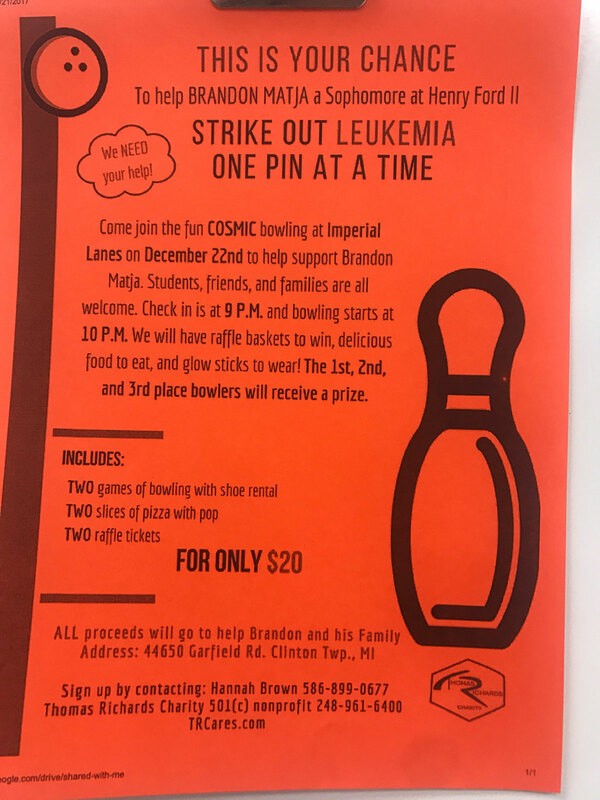 For those unable to make the bowling event but still wanting to help, a GoFundMe was made, which resulted in $135 was donated to Brandon and his family to help Strike out Leukemia. All the proceeds went to help Brandon and his family. Thank you to all those that came out to support Brandon, and thank you to all those who donated. On Thursday, December 21, 2018 we aided Deerfield Elementary’s S.A.I.L.S program. This program teaches Moderately Cognitively Impaired children (MoCI) for kids grade K-5; the curriculum includes teaching basic life skills like preparing meals. As a group, they incorporate these life skills with school subjects like Social Studies; for example, to learn culture, a traditional meal from each of 50 States is selected and prepared. The kids decide on the ingredients and the teacher, Megan, gets the groceries by using her own money out of pocket. What Megan and teachers alike at Deerfield Elementary are doing to benefit these students is phenomenal, and we wanted to support the hard work and dedication to serving and educating the S.A.I.L.S program. We achieved this with support from Noodles and Co. in Troy off Rochester Road; they supported the program by donating 50% of all proceeds directly to the S.A.I.L.S program. The night was a success and Deerfield Elementary’s S.A.I.L.S program was heavily supported. Thank you to all that came out; thank you for helping us help them. Matt Tingley was paralyzed in a motorcycle accident Summer or 2017 and his family needed to make their home handicap accessible and are continuously trying to pay medical bills from the accident. 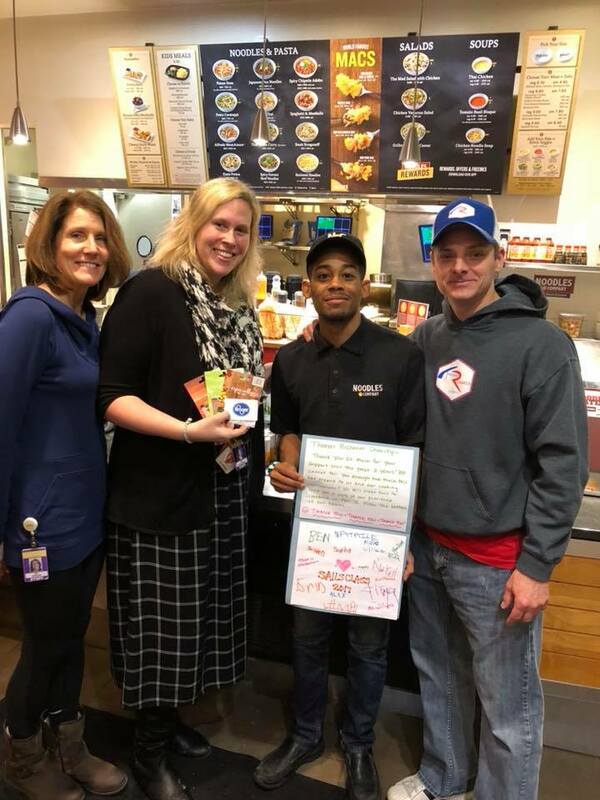 In order to help the family transform their home to be accessible for Matt and to aid in medical bill expenses, Noodles and Co. held a fundraiser. 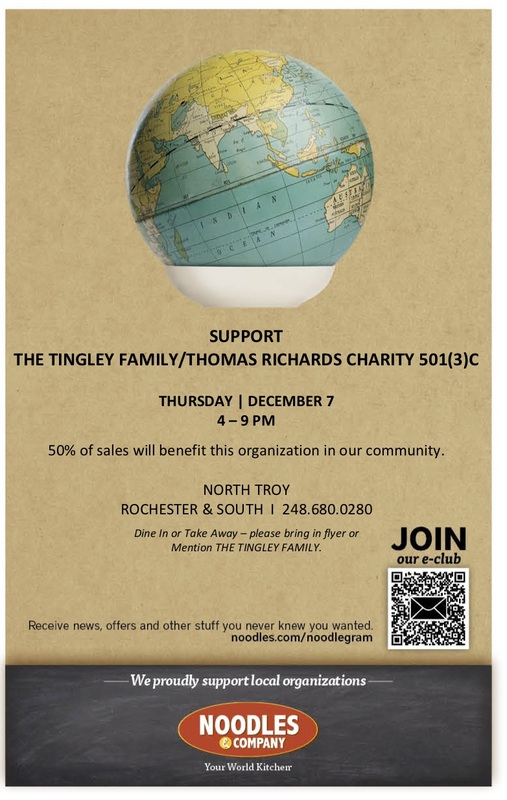 On December 7, Noodles & Company in Troy off Rochester Road helped benefit the Tingley family donating 50% of what was ate or drank directly to the family. The night was a success and we appreciate the support. A GoFundMe page was also created to benefit the Tingley’s, and as of May 2018 has accumulated an incredible amount of over $14,000 from donors. 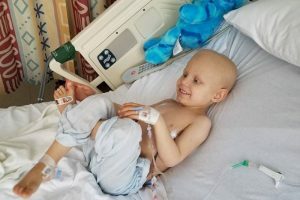 Suzanne Tedesco put on her 11th annual Pub Crawl and this year they helped raise money for Stephen and his fight with Stage 4 Neuroblastoma Cancer. More information about Stephen and his condition can be found in our following post “Noodles & Company in Support of Stephen”. 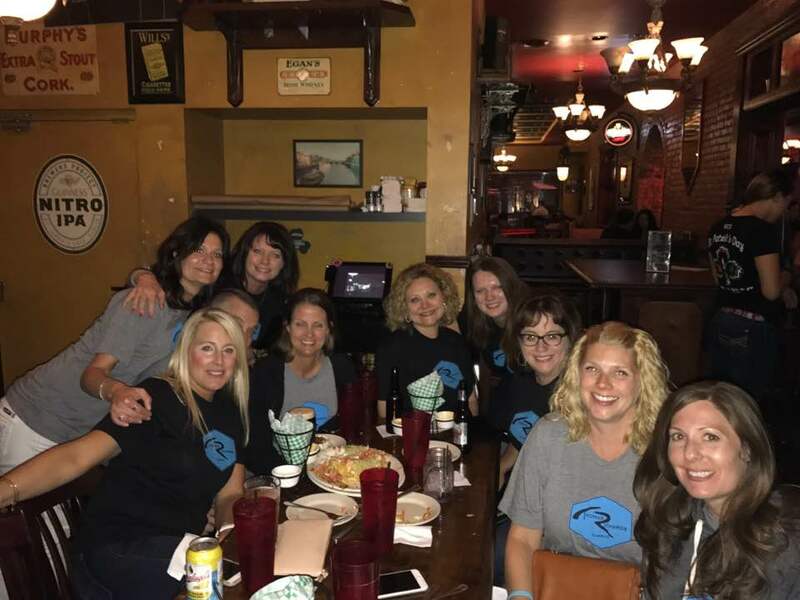 The 11th Annual Rochester Pub Crawl for a Cause was held on June 2nd, 2017. We visited 4 to 6 pubs throughout the day and proudly wore T-shirts that stood for the cause. The crawl was a success with $185 pre-registered pub crawlers; the success couldn’t have been reached without your support. We thank you for helping us help Stephen. A donation page was also created for donations on Suzanne’s behalf for Stephen; almost 75% of goal amount was met, and $3,657 was raised. We cannot thank Suzanne enough for all that she is doing for Stephen and all the people she has helped over the past 11 years. She’s an amazing woman. Thank you, Suzanne.